Peridot is a popular summer gemstone and the traditional birthstone for August, but for a bit more color many women are opting for peridot and citrine ring designs. Combining the delicate green of peridot with the refreshing sunny hue of citrine creates a colorful and beautiful gemstone ring for any occasion. Click on any ring photo for retail information. A large citrine gem can look beautiful as the center of a cocktail ring flanked by bright peridot accents. This also has the classic look of a three-stone ring and can be beautifully symbolic of a couple's past, present, and future. This unique look has a prong-set peridot stone in the center, accented with prong-set diamonds and bezel set citrine stones. This unique, stackable look is great on its own or with other peridot or citrine bands. A heart-shaped ring is a fun and romantic choice, and both peridot and citrine gems can be used to accent a large heart-shaped band. Diamond accents can give the ring more interest and shine. While peridot and citrine go well together, other gems are equally beautiful in combination with bright green and sparkling orange. Prehnite is a popular choice, as it's light color and translucent quality enhances the beauty of the peridot and citrine stones. Amethyst might be used to separate the peridot and citrine gems or could be placed on the ends of the setting to frame the other gems. There are a wide variety of gemstone shapes that work well with peridot and citrine stones, and oval shapes are both elegant and distinctive. For a balanced ring that highlights both gems, opt for two oval shaped gems that parallel one another for a symmetrical look. Boldly colored peridot and citrine gems cut into graduated emerald gems of different sizes can be aligned for a strong, beautiful ring. The yellow gold sets the colors apart even more, and makes the ring stunning. 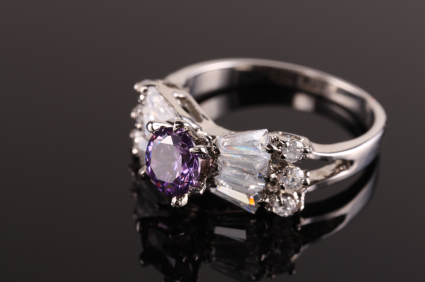 Alternating the gem colors helps balance the ring's size, but this design is still best suited for thicker fingers, since the large stones can look bulky or overwhelming on a petite hand. A peridot and citrine ring can be lovely even if neither of the gemstones is centralized in the ring setting. Peridot and citrine accents can flank quartz, topaz, diamond, or other popular center stones to give the ring a burst of beautiful color, and using a different center stone gives the ring design more flexibility for the wearer's preferences. Because peridot and citrine are in beautiful spring colors, popular designs tend to reflect that season. With stones forming the petals of the flower, or sometimes set in the middle, these rings are perfect for your right hand or to be worn for a special occasion. A large, colorful gem accented by glittering smaller gems are popular for cocktail or fashion rings, and peridot and citrine are some of the most popular choices for gemstones because of their bold yet light colors. These are perfect gems to wear in summer or fall when similar natural colors are popular, and a large ring design ensures the gems will stand out in all their glory. For a delicate ring design, consider a bypass band with scattered peridot and citrine gems. Because the band is thinner, this is an ideal option for a petite finger. The scattered settings and accent stone in a darker color can make the ring look more interesting, and give it a delicate yet modern look. Want more ideas for perfect peridot rings?